9 more sleeps | The Tales of Missus P.
I took this picture in 2011 at Beamish. This was the first Christmas I spent as a UK resident, although we had “Pre-Christmas” together in 2009, and “Post-Christmas” when I moved here in Jan 2011. Now I’ve been here almost three years and I plan on writing up a whole little tribute to the UK post when the time comes. As far as Christmas is concerned though, England does it so well. I know that the cities in the US and even some small towns would have celebrations and fun activities for people to participate in the festivities, but I’ve never seen such outpouring of “Let’s Celebrate!” as I have here. Aside from Beamish, we have ice skating at the Life Centre, we have the Fenwick window display, and we have Enchanted Parks at Saltwell. Also, the stores are full of Christmas appropriate food and gift boxes. Even if you just take a trip to Tesco, you can find plenty of presents that has some kind of incentive to buy with vouchers and sale prices. Even last Friday I went to Sainsbury’s to get petrol and the Salvation Army carollers were in the store entertaining the shoppers. Then we went to Tesco and a Silver Band was playing music in the entryway. You just wouldn’t get that at Wal-Mart in Florida. We have Christmas TV specials and this big break that everyone is so incredibly thankful for. Even when I was teaching last year, I was amazed at how Christmas break was treated like we would treat Summer Break in Florida. Kids had a Year 7 dance to go to and were allowed to dress up in their finest. Teachers went out to eat and dressed down for the day. Everyone who works has a Christmas party where they go out to eat. Bottom line is, the English love to celebrate Christmas and I’m so grateful for it. It’s nice to have some kind of positive, happy outlook on life with pleasant attitudes towards family time and just enjoying the holiday. For me, during this last week before Steve is off work until after New Year’s, I am working on a few projects (sadly I can’t keep one in check, I keep thinking of something new and having to do a little work on them to keep the initial ideas fresh.) But it’s good. The more I write, the more I write (if that makes any sense.) I have even found myself writing over the weekend, which I didn’t do before unless it was for NaNo. Yesterday I got 1100 words down. Making this a habit is one of the most important challenges in my life. 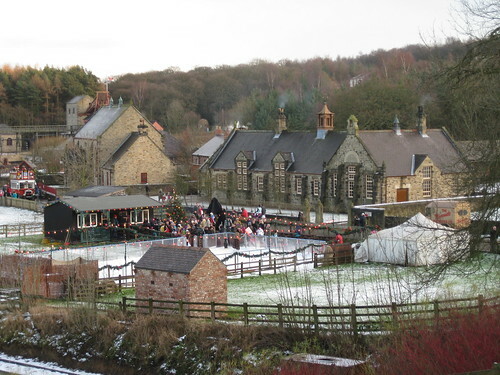 This entry was posted in All About Me, Books, Travel, Writing and tagged beamish, Christmas, holidays, Newcastle, UK. Bookmark the permalink. Hi. Lovely post. This is my 31st Christmas in the UK, and I really love the way it’s done over here (though I can’t actually remember how it was done at home, as it’s been so long.) Despite the happy, snowy memories my chiildhood Christmasas in a tiny Minnesota village, I love the British Christmas, even though it’s often crass and over-commercial. I do think they could everyone a break and retire that Slade song now–after 31 years my ears can’t take any more.